17 per cent of the world’s fresh water is found in a single lake. It is the second largest lake in the world (after Baikal), Africa’s deepest lake at 1.5 kilometer, and it has a shoreline almost 2000 km long. 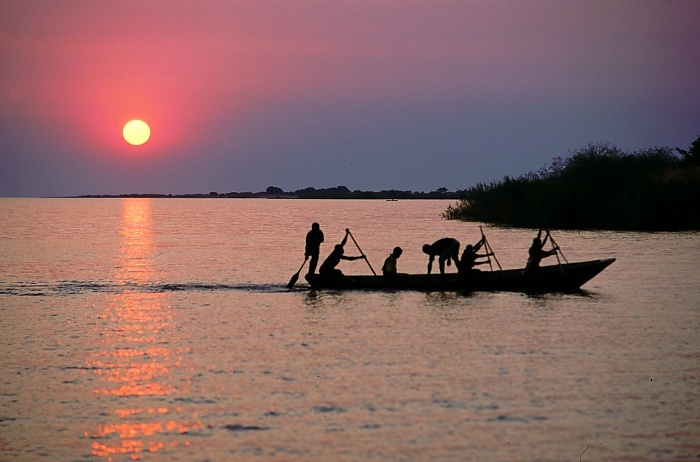 Lake Tanganyika is shared by four countries: Burundi, the Democratic Republic of Congo (DRC), Tanzania and Zambia. It is not on the tourist track and not nearly as popular as Lake Malawi or Victoria. Its tropical fish are not quite as psychedelically colourful as those of Lake Malawi, but are even more characterful and more desirable, difficult to keep – and expensive, as I found out starting to set up a Tanganyikan biotope aquarium! Recreating its water takes effort: the pH is 8.5-9, and the water is extremely hard (GH of 15), mainly with dissolved sodium, magnesium, and potassium. It could be called liquid rock if you could find rock with this composition. 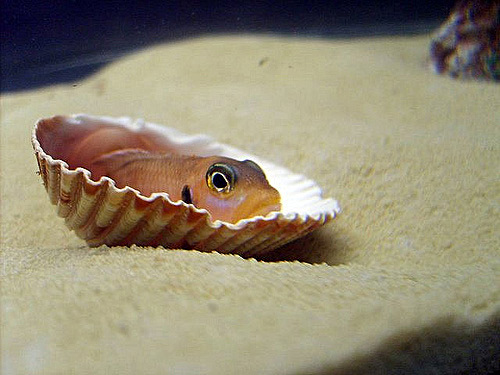 Luckily for fish keepers its cichlids can thrive under less extreme conditions. Most of the fish species in the lake are cichlids, a family that first evolved in ancient Gondwana, and are still mainly found in the southern hemisphere (geology has a long memory!). There are over 3000 species of cichlids in the world, and over 1500 of these are found in the lakes Victoria, Malawi and Tanganyika. Tanganyika has fewer cichlid species (250) than the other two lakes (700 each) but they come from a much larger number of different groups. It is therefore older, and more closely connected to the evolution of the species. Tanganyika also has modern (living) stromatolites, a large number of endemic crabs, and even a tiny freshwater jellyfish, the only one in all of Africa. It is an amazing place, and possibly the oldest lake in the world. But its water hasn’t always been as extreme as it is now. Its current state is due to a distant volcano. The East African Rift, which contains Lake Tanganyika, is one of the geological wonders of the world. The Rift is typically 50 km wide, 1 km deep (but as much as 2.5 km in some places), and extends from Mozambique to Ethiopia; it crosses the region where humans first evolved. Africa has been prone to rifting. One such rift caused India and Madagascar to break away from Africa. The scars are still seen in the shape of Africa’s coast line. Another rift split off the Arabian peninsula. The current rift tries to break down this ancient continent even more by forcing Somalia into the Indian ocean. Whether this will happen remains to be seen. Many developing rifts eventually fail, and this one may too. Around Tanzania the Rift splits into two parallel rifts, 600 km apart. The eastern one has most of the volcanoes, and the western one (called the Albertine rift) has the lakes. Both rifts started forming at about same time, 25 million years ago. At that time there was a large lake in central Africa (Lake Congo, which disappeared long ago), and rivers flowed into it from the south. The developing western rift captured one or more of these rivers. For a long time it stayed a swampy river valley, but by 10 million years ago two deep lakes had begun to form where crustal blocks had sunk. These became the core of Lake Tanganyika. At times they held separate lakes but over the past 100,000 years the water level has been much higher and it has been a single lake. In places, the sediment is kilometers thick. If the Loch Ness monster had lived in Lake Tanganyika, proven its non-existence would have been nigh impossible! In the absence of such monsters, Tanganyika, as the first of the rift lakes, probably inherited a fish population from the lost Lake Congo. After the discovery in 1883 of the jellyfish, Moore (Nature, published in 1898) recounted the story of a Dutch farmer, who, on the sudden appearance of herrings in the ditches on his property, sold it, on account of the indisputable evidence which such fish afforded, of the leaky condition of the dykes. He considered that the jellyfish, the crabs and the molluscs pointed at the lake being a relic of an ancient ocean. That is no longer believed: instead, they are now considered as due to parallel evolution. Lake Tanganyika has a very poor through-flow. This enormous lake has only three main contributories: the Malagarasi river, the Lufubu river, and the Ruzizi river. The only major outflow, the Lukuga river, act as an overflow: its entrance is over a high rock sill. (In order to control the fluctuating levels of the lake, which caused difficulties for harbours, a masonry dyke about 2 meters high was constructed in 1952 at the outlet of the Lukuga River.) It has the second largest volume of anoxic water in the world, after the Black Sea. The volume is 18,900 cubic kilometres. The in-flow is normally some 16 km3 per year, and rain over the lake adds another 29 km 3 each year. The outflow in normal times is 3 to 4 km3 per year, dwarfed by evaporation at 44 km3 per year. A molecule of water will stay in the lake on average for 440 years before escaping, and 80 per cent of its water will leave through evaporation. Dissolved minerals do not evaporate and have to wait on average 7700 years before finding the single outlet! Lake Tanganyika jealously holds on to what it receives. The main river in the rift, the Ruzizi, flows into Tanganyika from the north. That is the opposite direction to that 10 million years ago. Over time, geology can reverse rivers. The divide between rivers flowing north and those flowing south is not far from Tanganyika. 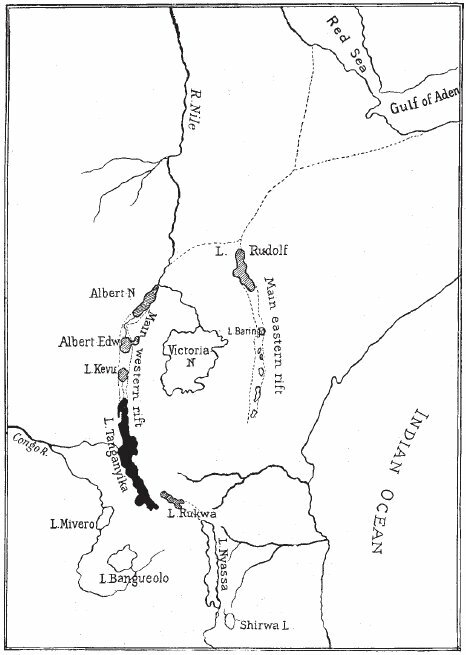 At the northern end of the Albertine rift, Lake Albert and Lake Edward’s water are both part of the flow system of the Nile, towards the north. 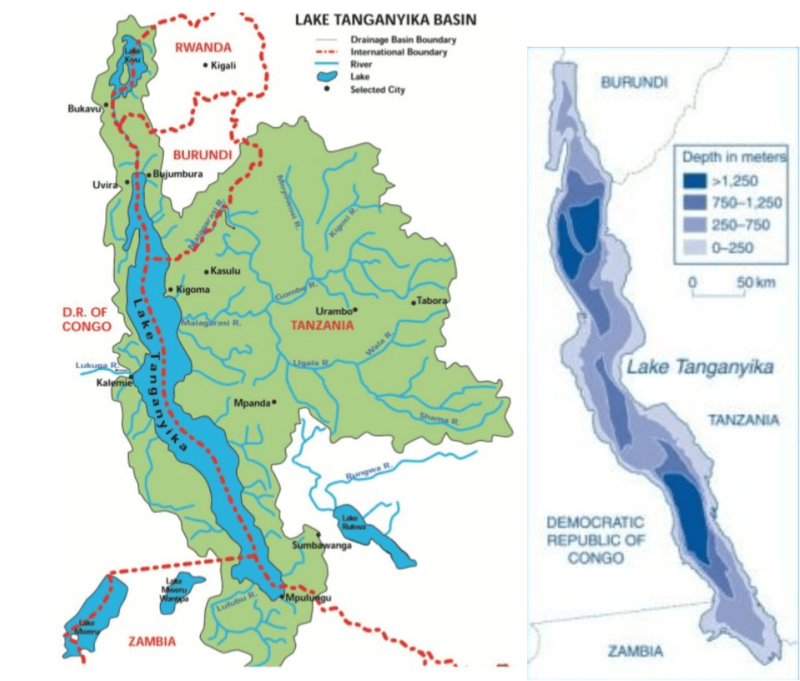 Tanganyika belongs (for what little water flows out) to the Congo. In between, Lake Kivu on the border between the DRC and Rwanda, drains to the south. It is the highest of the western rift lakes and the source of the Ruzizi river. The watershed is in the Virunga mountains, a range of highly active volcanoes immediately north of Kivu. The secret to Lake Tanganyika’s peculiar chemistry lies in Lake Kivu and its adjacent volcanoes. The Virunga volcanic field has 18 volcanoes, two of which are active. Mount Nyiragongo is one of the 16 Decadal Volcanoes and at times hosts the largest lava lake in the world. Mount Nyamulagira erupts even more frequently. Both have lava with very low viscosity which can travel for 10’s of kilometers, and the lava regularly reaches the lake. Lake Kivu is suffused with their volcanic produce. Below 250 meter depth, it is saturated with CO2 and methane. (The pH changes from 9.2 at the surface to less than 6 at 200 meters!) The estimated amount of CO2 is a staggering 200 km3. It would be a major hazard if the lake were to overturn as happened in Nyos in 1986, but that is a different story. The CO2 likely comes from hydrothermal vents under the lake, some 200 meters below the surface, which have been active since 5,000 years ago. The methane may be of biological origin. The water which vents into the lake is rain water, which has percolated through layers of old lava from the Virunga volcanoes, dissolving its minerals on the way. The vents bring ten times as much calcium into the lake as comes from in-flowing streams. Sodium is also strongly enriched (1/10th of the salinity of sea water), and magnesium (at 0.8 gram per kilogram of water) is twice as high as calcium. (As an aside, this may not be too dissimilar to the conditions on the young Earth where life first originated – but that also belongs in a different story.) Much of the calcium precipitates but some reaches the Ruzizi river. Sodium and magnesium do not precipitate easily and through the Ruzizi, end up in Lake Tanganyika. The high abundance of magnesium (Nyiranongo has particularly magnesium-rich lava) is characteristics of mafic magma. The term is derived from the MA from magnesium and the FIC from the Latin word for iron. Mafic magmas are also relatively rich in calcium and sodium. Mafic magma is young, and tends to come from the upper mantle. The presence in the spreading centre of the African Rift Valley is not a suprise. The final piece of the puzzle is also volcanic. Although Lake Kivu is about 2 million years old, the jump across the watershed is much more recent. 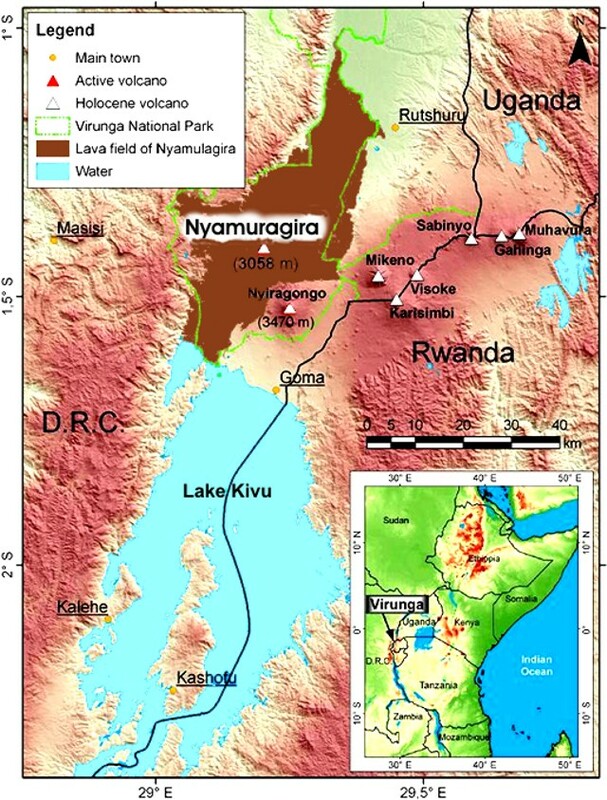 About 10,000 years ago, one or more eruptions from the Virunga volcanoes blocked its northward exit towards Lake Edward. These must have been impressive eruptions – one ash layer in the lake sediment is 2 meters thick. Lake Kivu rose by 400 meters, until it found a new exit southward, creating the Ruzizi river. Through the Ruzizi, Lake Tanganyika’s water suffered volcanic pollution. The damming has been dated from sediment as between 9,000 and 14,000 years ago. The rise leading to overflow into the Ruzizi happened 8,000 to 10,000 years ago. Sediments show that the water in Tanganyika became harder around 4,000 years ago. Calcium deposition began about 2400 years ago. Thus, its peculiar chemistry seems remarkably recent. Lake Tanganyika is an important part of the evolution of Africa. It was at the origin of the rich cichlid species across Africa, through a geological inheritance, and may have seeded the other, younger rift lakes as well as the Congo river. But the water properties have changed dramatically over the past few thousand years, caused by a volcanic field 200 km north, which changed the course of a river and polluted it with elements from the mantle. Fish species can adapt and evolve quickly. But perhaps it is not a surprise that Tanganyika cichlids can prosper in water less extreme than that of their current habitat. I won’t have to put a volcano in that Lake Tanganyika biotope aquarium. There is a set of steering currents that can in it towards the us yet, but the long range model guidance indicates an atlantic crossing. Each line is an individual model. Usually, The more of them that line up, the better the track guidance. All the main models do show it heading towards the Uk have its path initially blocked by high pressure ridge forcing it North west of ireland and with worst winds over Scotland, but some models to have it then moving under the Uk where others have it moving North East of Iceland. GFS has been fairly good with these storms , ECM is the old faithful and so we do have some uncertainty. rainfall totals will be hugely lowered due to the colder than normal Mid North Atlantic. The remnants of IDA moved Eastwards at lower altitude and merged with a depression, part of the reason for flooding with rain followed by storms in France. The energy from these systems split and Some of this energy will move into Southern UK tonight bringing some moderate rainfall. Both storms are sub tropical / extratropical of course by the time they reach the UK. To be tropical they need to have a warm core, These systems develop a cold core over the North Atlantic. …. Formerly known as “Bore Rider” on the old site. I’ve been checking in all year, but as I know nothing about volcanos, I keep my own counsel. On the other hand, should tides or (more particularly) tidal bores ever be relevant, I’m your man! Yes, UK surfers are waxing down their boards and trying to double guess what track this system may take. The consensus at present seems to be that it will duck under Ireland, which seems to be the most frequent path for extra-tropical storms. If it passes about 100 miles south of Cork at 970 or lower, the bore surfers might get an extra wave this year. A post on a bore? That would be an interesting challenge. Not sure how to get a volcano into the story. Well, should Kilauea have another eruption… After all, there was this volcanologist (Maurice Krafft?) who had the bright idea of going down a lava chute in a titanium canoe and why not an article on Maurice and Katia Kraft at some future date? Their documentaries and passion are what got me into volcanoes to begin with. And the 25th anniversary of their death should be next year. However, whilst the cause is obviously entirely different, there is a certain degree to which skills and knowledge are transferrable with tsunami, as both are large bodies of water moving with considerable energy (way beyond that of wind waves of similar heights) as both have very long wave lengths. My local tidal bore, that of the River Severn in England is, for example, approximately 12 miles thick. There are phenomena associated with it which no regular surfer will have experienced, and these are typically common to both tidal bores and tsunami. The concept of sieche is also common, and very important with tidal bores and particularly lake tsunami caused by quakes. – Although unlikely, the flood might drain partly from Síðujökull, which would cause flooding on Hverfisfljót, particularly at the bridge over Highway 1. Hverfisfljot is running along the western part of the Sidujökull glacier, Djupa is running along the eastern part of this glacier. There is a watershed between the two outside the glacier ( http://en.ja.is/kort/?type=map&x=556600&y=402099&z=5 ) . Could well be due to bad weather, except the onset at midday was well before heavy rain was forecast for this evening. ‘Fraid I agree with Rob. If you click on the monthly display (bottom left of the page you linked), it’s pretty clear that discharge rates at their present levels aren’t unusual on the Djúpá. And the IMO have been forecasting heavy rain recently… Unfortunately, the Djúpá page doesn’t show conductivity, so it can’t be compared in that respect with the Skaftá. Is there any volcano closeby Arnes-station? Not close enough; Hekla is about 20km to the East of there, and on the subject of the earthquakes happening near Arnes that question has been raised before – apparently it’s all tectonic. On the other hand, there have been a lot of earthquakes there again today (Monday) and they all seem to be in the same spot – so what the *%$K is going on?? If not Arnes, which station is most closest to Hekla? Yeah, a variation of this plot generated a bit of argument a while back. I had plotted all of the quakes along the SISZ with respect to energy release. What appeared seemed to take the form of an interference pattern similar to a 3rd or 5th harmonic or so. Why it was there was beyond me. 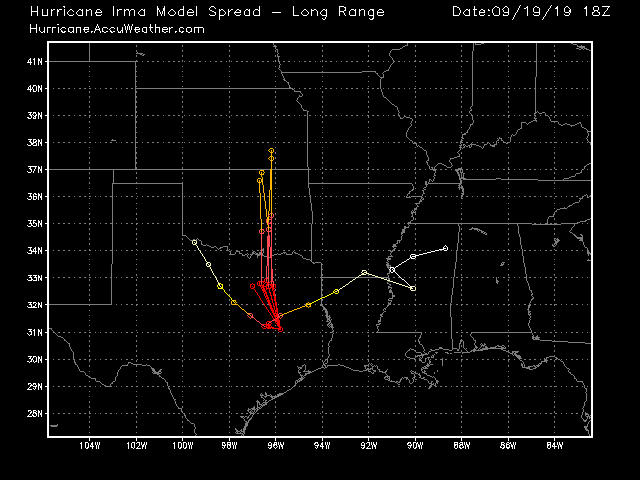 My only guess is that it has something to do with propagation velocities and stress modes. 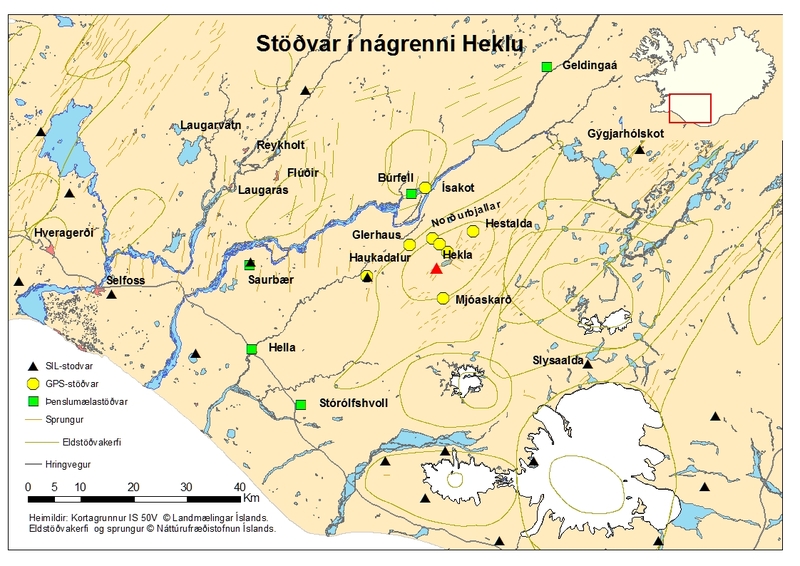 In this particular plot, the area around Hekla has a semi-circle that sort of denotes the quake path when Hekla last popped in 2000. At the outset of the seismicity for that, the quakes took the same path, except it only took about 60 minutes to get to the summit. Ehhh.. I’m too chicken @#$@ for that. It was a fissure eruption not that long ago. In my experience, when something goes wrong or bad, it usually does so in an abruptly quick and rude manner. Knowing that has kept me out of trouble. Carl’s lake is a bath? There has just been an M3 under Mauna Loa. Yes i got the web corders up and it continues to spark interest. Not significant in itself. It may just be taking up the strain from a few weeks of lesser quake activity. But it is unusual enough to warrant interest. See what happens next. There maybe one or more after shocks (1-2 mag weaker than the main shock). It gets notable if there is more than that. There was a increase in activity in 2005/ 2005 with large increase into chamber. So although you would expect 6 months of high activity before eruption, that huge increase in 2005 may only need a little more activity to change things. So taking that into account could activity change very quickly, or is what happened in 2005 irrelevant. My almost negligible knowledge is that its relevant and that its the whole gps change since last eruption, combined earthquakes etc that matters. That the precursor was in 2005 and the lull is part of the process. I would expect a lot more 3+ earthquakes before and so its at least weeks away, but could be 12 months or longer. So does what happened in 2005, make the forecasting of timescales different or is it not relevant? 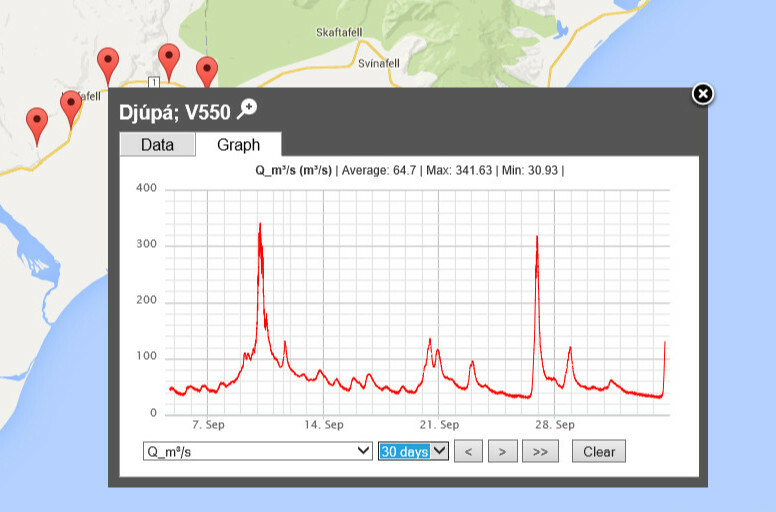 Leave the worrying to HVO/USGS; Mauna Loa is monitored (that’s how you know there is seismic activity, etc..). 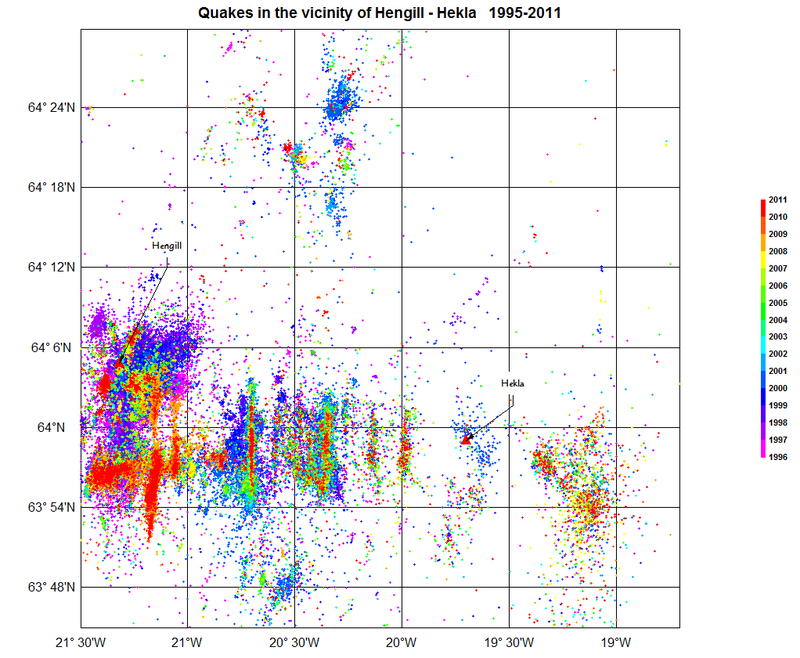 While volcanoes may be unpredictable and generate surprises, the chances of being in the wrong place at the wrong time would appear to be relatively low, especially if you keep an eye on anything HVO / USGS may say. If she does erupt, her previous eruptions have been mostly VEI-0, with a few VEI-1s and a 2 (source: http://volcano.si.edu/volcano.cfm?vn=332020 ). If you are planning to visit the volcano, itself, bear in mind that the summit is >4,000m so altitude and sun exposure could be problems. Im not worried, except of course that it may happen a few weeks after i come back home. If its going to happen soon i hope it whilst i am there, although unlikely now. I have been to island before and i go to the volcano centre and of course to previous or current lava flows. Took helicopter ride last time which gave some amazing sights of lava within the volcanos and lava taking out trees. I normally go up mauna kea which is planned again this trip. Im not likely to be in wrong place at wrong time, but may not be in the right place at the right time. Of course i want to see an eruption but looks like i may be something like a year too early.